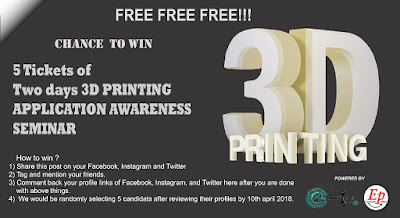 Here is a super cool chance to win Two day 3D Printing Application and Its Awareness seminar! 3) After completing above tasks comment your profile links of Facebook, Instagram and Twitter here. 4)We would be randomly selecting 5 candidate students after reviewing their profiles( Facebook, Instagram, Twitter) by 10th of April 2018.